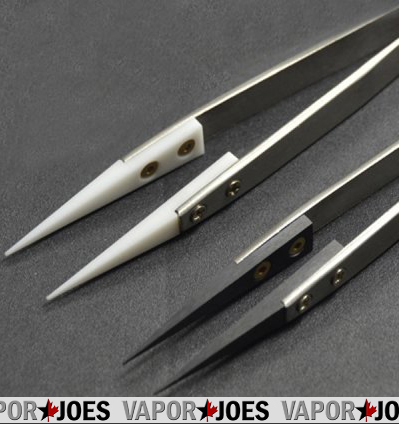 Vaporjoes.com – Vaping Deals and Steals – USA: CERAMIC TWEEZERS – BLACK OR WHITE- $3.90 – FS! USA: CERAMIC TWEEZERS – BLACK OR WHITE- $3.90 – FS! Here is a great deal on a pair of ceramic tweezers. An essential tool for anyone that rebuilds — the ceramic does not conduct electricity. This allows the builder to fine tune their coil without fear of a short. Now with your choice of black or white. A fantastic price at just $3.90 with free shipping from the USA. This is also a great resale opportunity for brick and mortars. By vapor-Sunday, February 7, 2016-Uncategorized-Comments Off on USA: CERAMIC TWEEZERS – BLACK OR WHITE- $3.90 – FS!